Surfing enjoys rich meanings, like surfing the Internet and surfing the ocean. The advent of Fosjoas K1 wireless remote control electric skateboard endows it brand-new meaning: surfing on the land. It also promotes the skateboarding to all-time high. What are differences between Fosjoas K1 electric skateboard and traditional ones? What special technological breakthroughs have been made by Fosjoas K1 R&D team? Then, the following will unveil them to you. 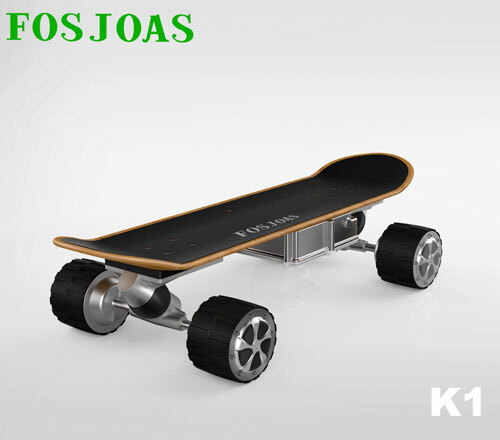 Fosjoas K1 motorized skateboard and ordinary ones are different in many aspects, including materials, craftsmanship, driving power and built-in intelligent system. According to the exterior, Fosjoas K1 electric skateboard is made up of an elaborately-designed board by world-famous designer, four high-end Cheng Shin tyres and the intelligent systems under the board. The high-end board, undoubtedly, enjoys excellent pressure resistance and long working life. The four Cheng Shin tyres and their tailor-made tread patterns pave the way for comfortable riding experience and high riding safety. Based on aerospace attitude control theory, fuzzy software algorithm and gyroscope system, the built-in advanced intelligent chips can calculate the intention of riders accurately. For example, if riders want to accelerate, they can lean forward and Fosjoas K1 electric scooter can speed up automatically. In addition, original design purpose of Fosjoas K1 self-balancing electric scooter is not confined to skateboarding. Of course, its comprehensive performance is much better than that of ordinary skateboards. Besides skateboarding, Fosjoas K1 electric skateboard can do a lot. It is like a daily transport. People can ride it to anywhere and anytime. When the condition is not suitable to ride it, such as climbing staircase, taking public bus or elevator, riders can carry it by hands conveniently because of small and light figure. At the same time, Fosjoas K1 is also designed for the whole people, whether they are the elderly or small children.